I originally went into business for myself so I could experiment with acoustical measurement hardware and methods. The reality of business being what it is, I’ve gotten away from that but I hope to start returning to my hardware roots later this year. In the meantime, I have been playing around with hardware in an attempt to make my own life a little simpler. Two weeks ago Saturday marked the end of an era for me as I traveled to Springfield’s hazardous waste disposal facility to divest myself of four lead acid batteries. 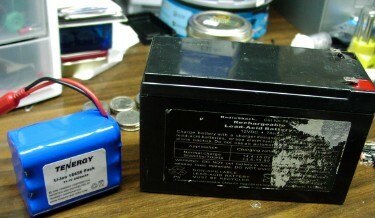 Like many consultants, I used lead acid gel-gel batteries to power equipment deployed in the field. Gel cells have the advantage of being ubiquitous and relatively cheap. The downsides, which became more and more apparent to me over time, is that they are heavy and too easy to fry. The weight was a problem for me because 85% of the time I’m working on a project by myself and hauling these batteries around as part of my kit got annoying really fast - for example, my smallest noise monitoring kit weighed 12 pounds, and half of that was the battery. I was also running into issues with reliability. My digital recording gear (I often make 24-hour sound recordings for project work) is fairly power-hungry. If I don’t pick up the kit within 26 hours of deployment, I run the risk of the recorder draining the gel cell below the threshold from which I can recharge it. I can use more than one gel cell battery for these kits to avoid the problem, but then there’s the weight issue again. I’ve wanted to try out lithium-ion or lithium-polymer batteries for some time. They have a much higher energy density than gel cells, but cost more. Much more. As a comparison, 12V/7Ah gel cell goes for $35 at your local Radio Shack, and you can find them cheaper at specialty electronics shops. An 11V/4.4Ah Li-on battery goes for about $50. On the other hand, the gel cell weighs 5 pounds compared with the Li-on at 10 ounces. Li-on packs also have built-in circuity to prevent over-charging and over-discharging of the battery. The 6V/1.2Ah gel cell in my Audio Toolbox finally gave up the ghost last year and I figured that to be as good an opportunity as any to begin my foray into Li-ons. I ordered a 7.4V/2.2Ah battery pack and rapid charger from All-Battery.com for not much money. It worked very well - my meter was now noticeably lighter and I was getting noticeably more measurement time out of each charge. The natural next step was to go bigger - I bought an 11.1V/4.4Ah Li-on for one of my noise monitoring kits. Again, this proved successful; the battery lasts essentially indefinitely (my unit runs out of memory after 4 days and the battery was still going strong) and adds negligible weight to the kit. My most recent acquisition was a 14.8V/9Ah battery pack that I use with my Marantz PMD670 for long-term audio recordings. I get well over 30 hours with the one battery back versus 22-24 hours I got with the 7Ah gel cell, at about a quarter of the weight. Li-on battery voltages are multiples of 3.7 volts (7.4V, 11.1V, 14.8V, etc). Many electronic devices are designed for alkaline batteries and want multiples of 1.5 volts (6V, 12V, etc) for external power. If you have a device that’s sensitive to the power voltage, you may have a problem with Li-ons. I’m fortunate that all of my equipment can tolerate wide voltage ranges, so it’s not been a problem for me but your mileage may vary. Remember all those stories about exploding laptop batteries that made the news a while back? Well it turns out that’s what can happen when good Li-on batteries go bad. As a result you have to be careful about handling them. In particular, you should never leave them unattended while charging and you shouldn’t expose them to temperature extremes. They aren’t quite as “set and forget” as gel cels. Related to the danger of exploding batteries, TSA has placed restrictions on the number and capacity of lithium and Li-on batteries you can carry on a plane. This may hamper your travel plans if you want to check your equipment. However, with all the restrictions and fees airlines are placing on checked luggage, I’ve been shipping equipment to sites ahead of time rather than taking them with me so this hasn’t affected me. Finally, as noted above, Li-ons are significantly more expensive than gel cells. However I think the higher initial cost is offset by the lower weight and higher reliability. Time will tell. I’ve been happy enough with Li-ons that I use them exclusively now for field equipment - my last two gel cells have been relegated for use in my uninterruptible power supplies. 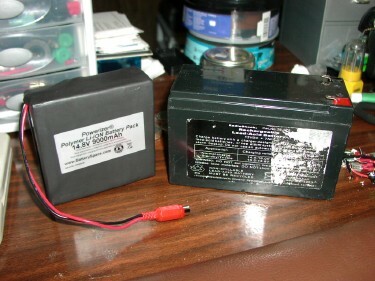 My next purchase will be a couple of sets of Li-on 9V batteries for use in my ICP power supplies. If any consultants out there have tried Li-ons, I would love to hear about your experiences.